As 5G technology is approaching realization faster, a surge could be noticed in the patent filing activity by telecom companies. China is at the forefront, in terms of filing numbers, as major telecom giants like ZTE and Huawei are filing patents internationally with good momentum. Qualcomm, the top innovator in 4G LTE, is not behind either as it continues to accrue IP for 5G technology. While patent filing numbers have increased in recent years, patent litigation statistics paint a different picture. The number of patent infringement cases in the telecom sector has dwindled in the past two years. We noticed this while we were researching the latest trends in the Telecom domain. 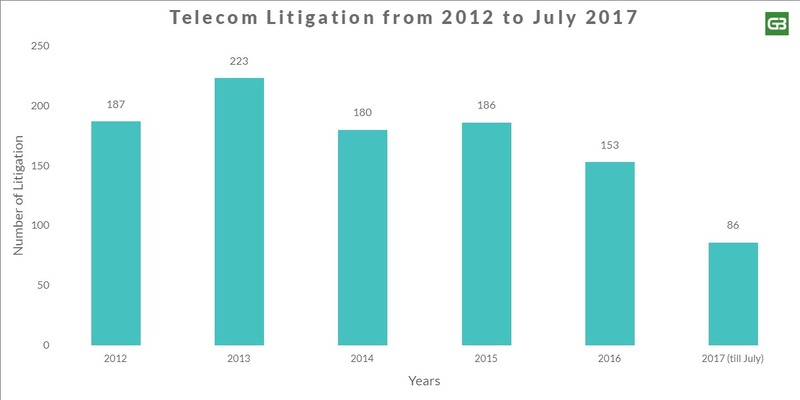 As a part of the analysis, we had a look at the litigation data of the telecom industry in the US. What follows next is a brief report on telecom patent litigation in the US spanning from 2012 to July of 2017. From the beginning of 2012 to July 2017, a total of 1015 telecom cases were litigated in the US. The litigation count, though, crossed the 200 Mark in 2013, dwindled back below 200 next year and the downward trend has continued ever since. 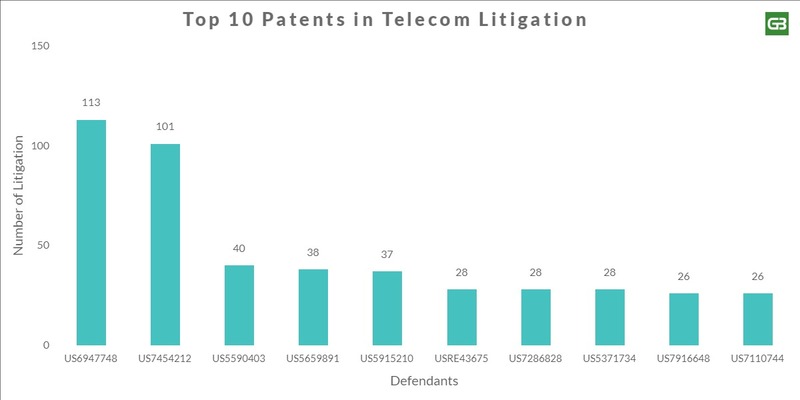 Our research indicates that 203 plaintiffs participated in these 1015 telecom patent litigations, with Adaptix filing the most number of lawsuits: 134, which is about 13.2% of the litigation pie. Adaptix, a 4G wireless company, was bought by Acacia Research, a well-known NPE (aka Patent Troll) in 2012 for $160 Million. At that point in time, Adaptix had 230 issued and pending patents in 13 countries. Adaptix patents were on 4G technologies, especially on OFDMA and MIMO, and post-acquisition became the reason for top telecom and smartphone companies’ litigation. Apple alone was a defendant in 23 of these 134 lawsuits. Major tech and telecom giants including Google, Sony, AT&T, Verizon, and Motorola were also dragged to the court. Luckily for the giants, Federal Magistrate Judge Paul Grewal, ruled the patents invalid saving these giants Millions in royalties. Adaptix (owned by Acacia) was not the only company that attacked Tech and Telecom Giants. Mobile Telecommunication Technologies LLC filed 42 lawsuits against companies like Sprint and T Mobile. Charles C Freeny, the third largest plaintiff, filed 38 cases, targeting some of the biggest smartphone brands – Apple, Samsung, Nokia, Motorola Mobility, LG, HTC, and Huawei. Looks like none of the biggest players innovating or working in the field were spared. But who was impacted the most? Let’s find out. Apple faced the most wrath. Out of 274 defendants that were dragged to the court in these 1015 cases, being a part of 61 litigations, Apple paid the most visits to the court. Apple was challenged 23 times by Adaptix, 7 times by Ericsson, and 3 times each by Cellular Communication and WiLAN. At the end of the lawsuit, Adaptix patents were ruled invalid by the court. 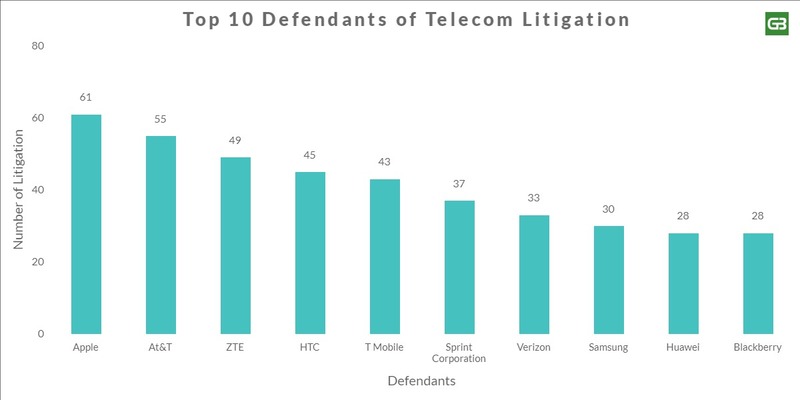 AT&T, the second most targeted defendant, was a part of 55 litigation campaigns, 12 by Adaptix and 9 by Callwave. The Chinese telecom company ZTE is the third top defendant. Out of 49 litigations, Adaptix was the reason for 10 litigation while Cellular Communication became the cause of 4 lawsuits. Enough of inspiration. The next question, we had pondered over for a while, before we had the answers. This is one of the most important questions, as it reveals the most important and valuable patents in the domain. A total of 1038 patents were involved in litigation during the five-year span. Before I reveal the top 10, quiz time. If the top plaintiff Adaptix was involved in 134 litigations, whose patents would be the most litigated one? The answer, of course, is Adaptix. Its patent US6947748 was a part of 113 different cases. The US’748 patent covers a concept of OFDMA, a 4G technology to assign multiple users to access subsets of subcarriers. The second most litigated patent, US7454212, by Adaptix, was a part of 101 litigation campaign. Down the road, the third and fourth most litigated patents belonged to the second largest plaintiff Mobile Communication Technologies LLC. Part of 40 lawsuits, US5590403 introduces a method of communication between a central network and mobile unit, a multicarrier technique. US5659891, a subject of two lesser lawsuits by the same assignee, also belongs to the invention of multicarrier techniques. 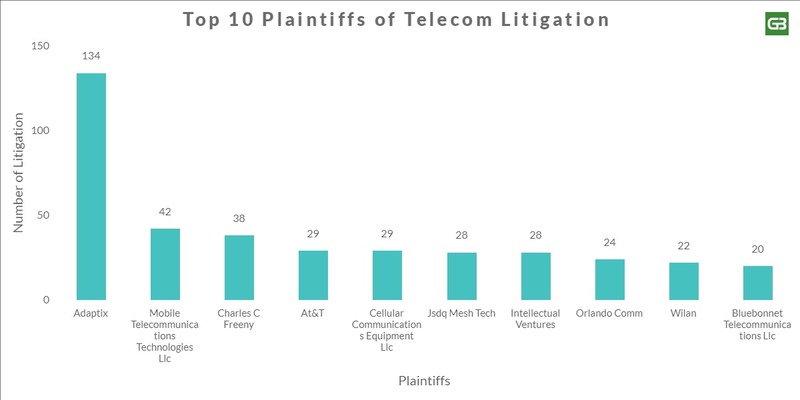 Overall, out of the 10 most litigated patents, 8 of them belonged to the top 10 plaintiffs of telecom domain. A valuable insight which goes on to show that, telecom plaintiffs choose their weapons of war very well, and post choosing them, know how to make the most of them. Now that we have an idea of the top patents and litigation parties in the domain, one question still ponders in the mind – Why is there a decline in litigation numbers in the past few years? We did some digging and came across a few reasons speculated as responsible for the fall in the number of litigations taking place in telecom domain. What could be the reasons for declined litigation? While some point to decisions handed by SCOTUS during recent years as one of the reasons for low litigation count, most believe that AIA might be the chief reason. America Invents Act established joinder provisions – which changed the rules on patent litigation complaints – by limiting the number of defendants a plaintiff could sue in a single litigation, which was speculated as one of the reasons of the fall in litigation number. However, according to an in-depth piece published on IPWatchdog, case filing numbers were not significantly altered by AIA. This reasoning was supported with numbers over the period of eight years spanning from 2008-2016. Given that numbers don’t lie, it makes us ponder if not AIA, what else might be the reason? There is a lot of chatter about Form 18. Responsible for making filing a patent infringement suit easier than ever, using form 18, a patent holder wishing to file a suit for direct patent infringement only needed to identify the infringing party, the infringed patent, the infringing device, and provide statements of jurisdiction and patent notice. Plaintiff-friendly, Yes. Not all good things last long. According to courts and commentators, Form 18 required insufficient factual information and recognizing the deficiency, the Federal Rules Advisory Committee submitted a proposal to SCOTUS to abolish form 18. The supreme court gave a nod to it and the change took effect on December 1, 2015. The immediate impact post this change could be noticed in the litigation numbers as cases dropped from 1610 in Q1, 2015 to 1067 in Q1, 2016. The abolishment of form 18 is one of the chief reasons for the fall in numbers, as it eradicated the “ease factor” of filing an infringement lawsuit. Does that impact telecom litigation too? Definitely. TC Heartland Vs. Kraft Foods, Alice Vs. CLS Bank – Two of the biggest decisions handed down by SCOTUS changed the patent litigation landscape forever. The Alice decision became a curse to software patent which also dropped the litigation count by 40% year-on-year as per by Lex Machina. This piece by IAM portraying patent litigation numbers post-Alice decision is an eye-opener to the power SCOTUS decisions hold. Alice ain’t alone. THE TC Heartland decision passed last year had as much impact on litigation landscape though it only involved venue. According to a report by IAM Media, 2017 saw an 11% decrease in the number of patent disputes (PTAB+ District court), from 6000+ cases filed in 2016 to a bit above 5400 in 2017. The numbers are on a decline from 2015 and with important decisions like Oil states and SAS Institute that challenges the constitutionality of IPR pending judgment, the numbers might further take a plunge. Now though none of these decisions are related to and affect the Telecom industry directly, it goes unsaid that SCOTUS decisions affect the US patent litigation landscape on the whole, and in turn, end up impacting the litigation scene in telecom domain. Call it the effect of all the recent amendments in patent law and the decisions issued by SCOTUS, a fall could be noticed in litigation activity of NPEs. From the first quarter of 2016, NPEs shifted their focus of litigation away from rich companies resulting in a fall in litigation count. The low trend had been noticed from Q1 of 2016 which showed the lowest, 496, defendants added by NPEs which was about the half the numbers in Q1 of 2015. Besides, according to a report, NPEs have decreased their settlement price and they settle for way less than they did earlier. Pre-Alice, NPEs settled at an average of $2.1 Million which has changed post the decision, now settling for an average of $1.5 Million. Given that companies have come to recognize PTAB as an efficient tool to deter unwanted litigation, it only makes sense that NPEs agree to settle lest they face the wrath of PTAB axe. It does explain the fall in numbers, doesn’t it? Given that the NPE scene is as much relevant to telecom domain as to others, in combination with other decisions, the litigation numbers in telecom domain is the direct result of all these factors combined. It would further get affected post the two pending SCOTUS judgments, which might end up affecting or changing the litigation landscape in the telecom domain and overall. It is a matter of time before we find out. Authored by: Vipin Singh, Research Analyst, Market Research. PS: We at GreyB love performing analyses that unveil some of the most pondered questions in tech. If you like to stay informed with industry trends and like having a deeper look at things, our articles would appeal to you. Want them in your inbox? Subscribe to our newsletter and enjoy a lifetime of industry insights in your inbox, no strings attached.